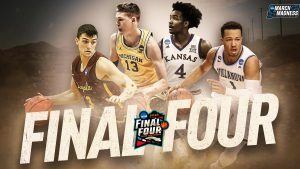 This year’s Final Four is set with Michigan, Loyola-Chicago, Villanova and Kansas in San Antonio. This year’s tournament has been anything BUT normal. There have been powerhouse schools such as Virginia, Arizona, North Carolina and Xavier all getting bounced early. #16 seed UMBC knocked off the overall #1 seed Virginia by 20 points! That was the first time a #16 seed beat a #1 seed in 136 chances. Let’s take a look at all four teams in this year’s Final Four and get my predictions of who cuts down the nets in San Antonio. Cinderella, also known as Sister Jean and the Ramblers have worked their way through the likes of Miami, Tennessee, Nevada and Kansas St. on their way to the Final Four. America has fallen in love with this team and to even think that a last-second buzzer beater in the 1st round saved Loyola against Miami. They routed Kansas State, 78-62, on Saturday to earn a trip to the Final Four for the first time since 1963, when Loyola-Chicago won its only national title. The Ramblers will face Michigan next weekend in the national semifinals in San Antonio. Saturday’s victory promised to keep the team’s 98-year-old chaplain, scout, and inspiration, Sister Jean Dolores Schmidt, in the spotlight for at least another week. 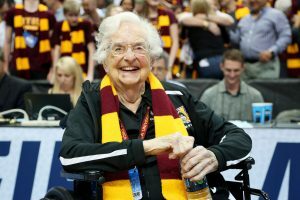 It also fulfilled a prophecy by Sister Jean, who picked her beloved Ramblers to reach the national title game in one of her brackets. She called it her Cinderella bracket. The Wildcats are going to the Final Four for the second time in three years. Jay Wright’s Wildcats have been in the Top 3 of college basketball all season long and ran the table in the Big East tournament in route to another #1 seed. Villanova has the experience of the Final Four on their side and the junior leaders of Brunson, Booth, and Paschall know what it takes to win a national title. If you’re looking for experience and talent….Villanova is your pick! Bill Self has his Jayhawks back in another Final Four. The last time the Final Four was in San Antonio, the Jayhawks beat Memphis in overtime to win Self’s 1st national championship. If the Jayhawks can continue their hot three-point shooting like they did against Duke, the Jayhawks may claim another title in the Lone Star state. Kansas is quick and fun to watch and it’s great to watch their fast paced tempo. I think the clock strikes midnight for Loyola and the size and toughness of Michigan is too much for Loyola to keep pace with. I expect Michigan to wear them down after a close halftime score. Michigan will advance to another National title game under Beilein. Loyola will give Michigan a fight, but I expect the tournament experience of the Wolverines and the three point shooting will get them past the Ramblers. 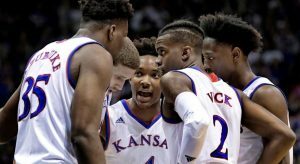 Bill Self and the Jayhawks won their last national championship when the site was San Antonio, I think it’s destiny to get to the championship game and with too many shooters, Villanova can’t keep up. It will be a great game but I have the Jayhawks advancing to Monday night. 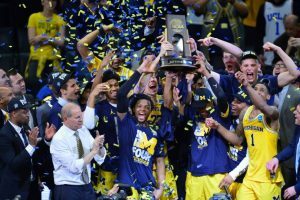 The national championship game matches the Wolverines and the Jayhawks. This will be a great game with a lot of scoring. Take the OVER. I think it’s back and forth all game long and with a gun to my head…………. 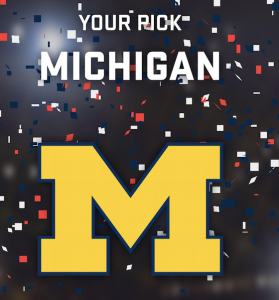 I’m taking the streaking Wolverines to win 81-77 to claim their 2nd national championship in school history!